Emily Arnold McCully’s sweeping watercolor paintings carry the reader over the rooftops of nineteenth-century Paris and into an elegant, beautiful world of acrobats, jugglers, mimes, actors, and one gallant, resourceful little girl. Emily Arnold McCully was born in Galesburg, Illinois, and grew up "a daredevil child," always climbing trees or buildings. She made it to college intact, however, and received her B.A. from Brown University and an M.A. in art history from Columbia University. Emily McCully's artwork has been included in the International Biennale at Bratislava, and she has won a Christopher Award for Picnic, one of the many picture books that she has both written and illustrated. Writing also for adults, Ms. McCully has received grants from the National Endowment for the Arts and New York State Council on the Arts. Her book, A Craving was nominated for an American Book Award. 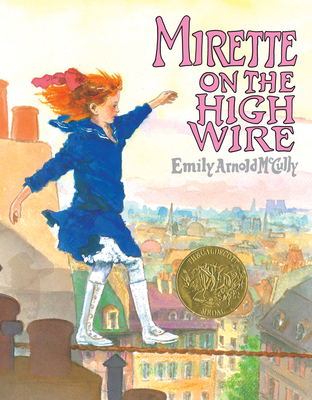 The idea for Mirette on the High Wire began as a biography of real-life daredevil Blondin. But the author changed her mind to accomodate the tree-climbing child and risk-taking adult she was and is.